I don’t even know where to even start. How about this: MAKE THESE RIGHT NOW. They are seriously one of the most delicious things I have had. Salty, sweet, buttery & caramel-y. But let’s back up to a few weeks ago, when my friend Lauren came to visit. Lauren and I both have a love of rice krispie treats and all their many forms. I happened to write a book about cereal desserts a couple of years ago. Lauren has made them with ruffles chips. I made them with pecans, caramel and chocolate and also with lucky charms. And she has made them with ritz. So as we sat at lunch (a healthy lunch — I should add), we were discussing all the ways we love to trash up some rice krispie treats. Then we had a brain child. 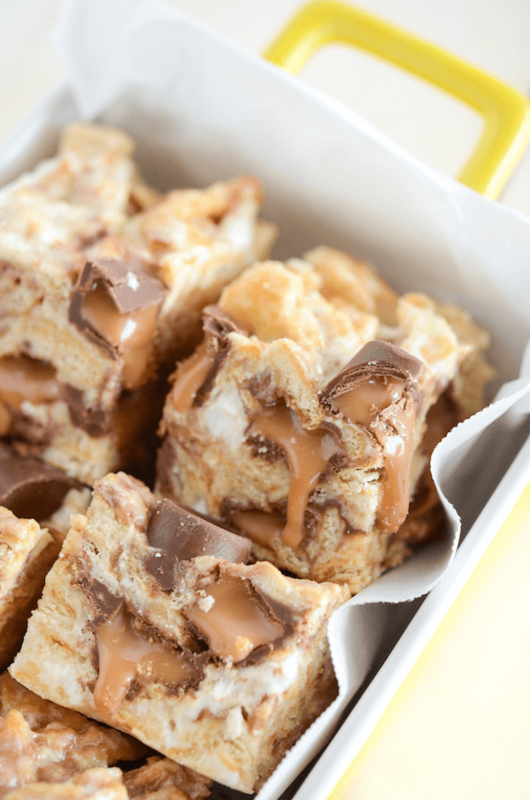 Rolo Ritz Marshmallow Treats. 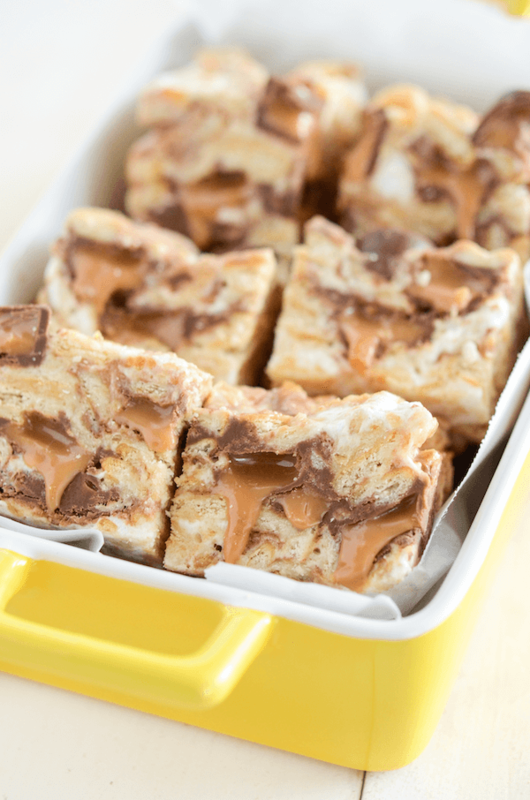 We were nervous at first when we pulled them out of the fridge, but once we cut into them and saw the gooey caramel…well, we knew they were going to be amazing. 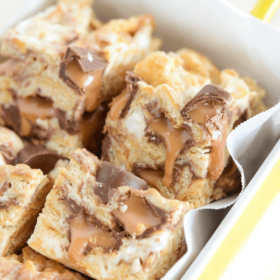 These Rolo Ritz Marshmallow Treats are very buttery with that perfect salty/sweet combo. I loaded them up with extra marshmallows and a little extra butter for good measure. Then you stir in the the rolos for chocolate & caramel bites throughout. I promise you are going to LOVE these. Grease an 8×8 pan with butter, set aside. In a large non-stick pan, melt butter over medium-high heat. Once melted add 1 and 1/2 bags of marshmallows, stirring until marshmallows melt completely. Stir in vanilla extract. Remove from heat and quickly fold in ritz. Stir in remaining 1/2 bag of marshmallows and then fold in the rolos as fast as you can. I poured 75% of them in and did one quick fold (saving the rest for pressing into the top for decoration). Transfer mixture to prepared pan and spread evenly using a buttered spatula. If you saved any rolos, press them into the top of the marshmallow treats now. Allow to cool completely. You can speed up this process by cooling them in the refrigerator. When cooled, cut into squares and serve immediately or store in an airtight container for up to a week. 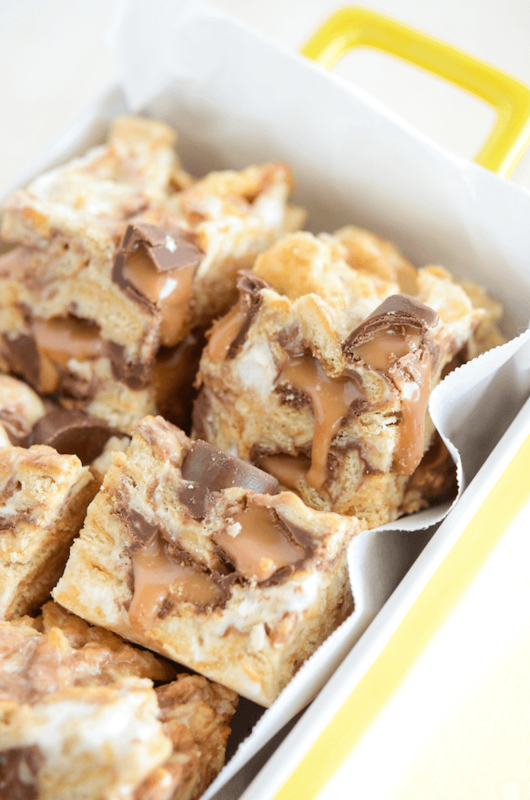 Oh my word, yes I totally need to make these right now!!! Ooey-gooey deliciousness right here!! WHOA! I need to go workout after looking at these amazing things!!! They look SO good! I’m almost speechless! These treats look amazing! So simple but so decadent at the same time! The oozing caramel just practically jumps off the screen! A genius combo! Thanks for the recipe! These turned out very tasty according to my coworkers. They were however a little difficult to cut after being refrigerated overnight 🙂 My rolos melted in a bit more than yours so they weren’t as pretty to look at as yours but still tasty. These look amazing! I can’t wait to try them. What size box of Ritz crackers? I couldn’t find one with 4 sleeves. Thanks.